I've noticed that lately the problem with the blocked accounts is that players see you next to the saleswoman, I spent a lot of time at bots and I can be sure of this, not even a gm appears in the logs, often they stay with normal accounts that obviously block your account because they have proof.As a great suggestion, which can also lead to a decrease in the account lockout rate, to implement the "bottling of items in the botting area" or "sell items from one side to the the most marginal of the city, where a player rarely passes "..... I say this because probably as you can raise an object without being near the blacksmith .. this would be the biggest update brought. Fisherman options is very able,capable...but sometimes you just need to buy potions...and there intervenes the saleswoman! 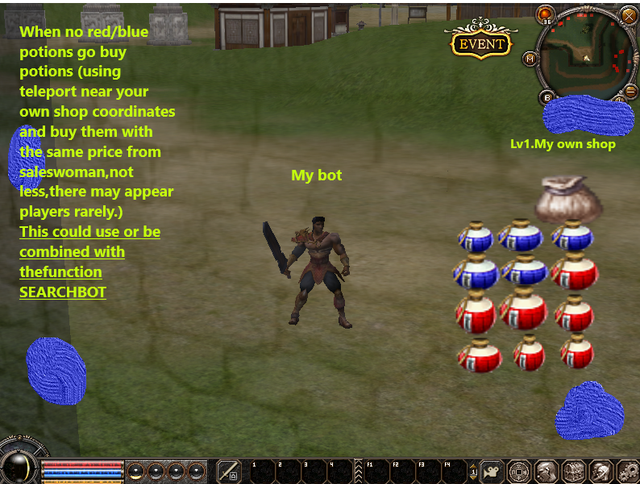 Would be possible, yes...but then these NPCs must not have any Quest Dialogs, because these can be very difficult for the bot because he can't bypass then. So one click and the Shop would have to be open. We should also have an option where we can say on what fisherman to sell the items or in which village the bot should go to the saleswoman to sell the stuff and so on, all my bots get banned constantly without a GM in the logs but just because they teleport to the saleswoman and players can see that very easily. i noticed that banns with porting to the saleswoman since several weeks too. My characters are prepared since that moment, that they never have to go to the saleswoman anymore. The problem is not the staying or porting there the problem is when the character is porting away. The most safe looking method would be porting to the saleswoman, finish what the character wants to do there, get a kick for Channel Switch, log in to the new channel and port away in the time where the char is not viewable for others. For this Step should be the change channel if other players are near you deactivated that the character dont change it again after log in. great idea, my bots are also banned because of selling items. Can someone explain me option: go to fisherman if no potions needed? 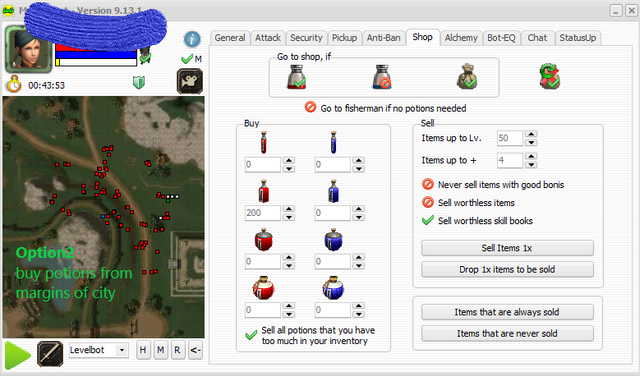 that means bot will sell items to fisherman? @Slait gotta say "sell to fisherman" doesn't work in map2 (yellow) it never goes to fisherman,without potions being needed. However, I want to fix myself on one of these methods. What isnt possible is to buy from a Shop when standing far away from it, even if the NPC is visible it still doesnt work when you are too far away. but how the blacksmith thing work?u can be anywhere,lol. There are different checks, for the Blacksmith it works, yes, but not for normal selling. i think this suggestion would work too..maybe better...no potions to buy?go to fisherman and sell items....no potions?teleport to your own shop account and buy them...i need opinions.. In the next Update we will first add a small feature that makes the coordinates random by a few meters every time. Then we will see further. PS: @gantos We will warm your account if you do intense spamming here without any useful content! Well this also means that your own shop have to be there active the whole time while you are botting.